I suspect my love of soil is a product of rural upbringing – barefoot summers between rows of fruit trees, freshly tilled earth, the vegetable garden – soil took on familiar scents akin to that first whiff of spring or frost following summers’ last gasp. Soil has magical properties – a deep turn of the shovel reveals its life giving power. One whiff, enough to determine potential locked inside nature’s garden. Good soil assaults the senses – black, layered with decomposed organic material, crawling with worms, odors of musky promise – capable of plucking primal strings, a reminder of ancient seeds responsible for humanity. My garden doesn’t have the best soil. It took me two years to see earth worms wriggling in the flower beds after sixty year old plumbing forced total excavation and replacement of the drainage system. Living in a rain forest doesn’t help – turn away for an instant and moss carpets everything in sight. Today was a glorious spring offering – the warmest day this year at almost 20 C, a day scented with blossoms and freshly turned soil. At first earthly perfume registered as nothing more than a neighbor gardening. Soon I noticed people walking past my house with buckets and wheel barrows. Down the street I could make out a huge pile of black earth. 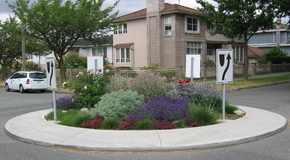 Vancouver is full of traffic calming circles planted and maintained by local residents. The homeowner adjacent to one a few blocks down had called the city requesting some top soil for the circle garden. The city obliged – not with a few cubic yards but an entire dump truck load. Placing what was needed in the public garden – the remainder was up for grabs. I can’t say which is happier – myself or my garden. Intoxicating aromas of rich soil waft through my open window, the garden freshly dressed and full of promise.